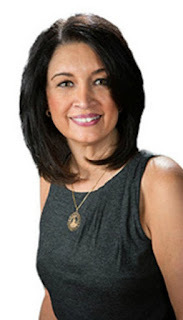 Her debut novel, Evanthia’s Gift, is a women’s fiction multigenerational love story and family saga, influenced by her Greek heritage, and the many real-life accounts that have been passed down. She continues to pick her father’s brain for stories of his family’s life in Lesvos, Greece, and their journey to America. Her interview with him was published in a nationally circulated magazine. a generational family saga and contemporary romance. This last book focuses on the current youth of today in this Greek-American family. As with the other two books, the story flashes back in time to the youthful days of the older generation, going back as far as the 1920s in Kefalonia, Greece. Although this book can be read as a standalone, I recommend reading the first two books for a richer experience. IAN: Is Chasing Petalouthes published in print, e-book or both? Effie Kammenou: Chasing Petalouthes is available in print, Kindle and on Audible. The entire trilogy is available in all of these formats. IAN: Where can we purchase a copy of Chasing Petalouthes? IAN: What inspired you to write Chasing Petalouthes? 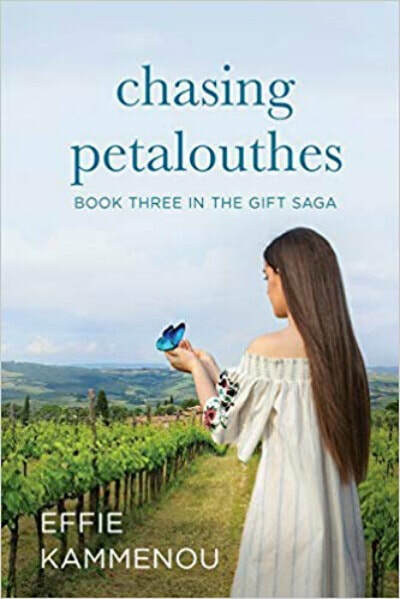 Effie Kammenou: Chasing Petalouthes is the last book in The Gift Saga. Each book in the trilogy deals with a different generation of a Greek American family and their closest friends. The current generation is the focus here, inspired by my own children, their friends and the world in which they live. Each generation has learned from their elders and even from some ancestors they’ve only heard about through family history. The same holds true here, as this book binds all the generations together, showcasing how each life affects the other. IAN: How long did it take to write Chasing Petalouthes? Effie Kammenou: Each book takes me a different amount of time to complete. One of the biggest factors is how much research needs to go into the story. Evanthia’s Gift took me almost three years to write. It’s not only the longest of the three books but it also required the most research. Chasing Petalouthes took about a year and a half. IAN: How do you come up with the titles? Effie Kammenou: I find titles to be the most challenging part of writing a book. Chasing Petalouthes came to me quickly and I never questioned it. Petalouthes means butterflies in Greek. Essentially, the book is titled, Chasing Butterflies. There are many books with this title. There is no other carrying the name Chasing Petalouthes. It fits the story perfectly as the two main characters discover who they are as they approach adulthood. Effie Kammenou: Since Chasing Petalouthes is part of a three-book saga, I want readers to take more from it than just a simple love story. It’s so much more than that. This book is a tribute to love in all its forms—love of family, culture, friendship and humanity. And of course, romantic love. Readers not acquainted with Greek culture and traditions will become fully immersed in it. Readers with Greek heritage will enjoy the familiarity. I also want younger readers to recognize the importance of the past, family history, and the lessons that can be learned from elder relatives. Effie Kammenou: As much as I love to read a feel-good romance that is pure fantasy, I wanted this book to be real and relatable. There are many ups and downs in this book, difficult situations and happy resolutions. The first book was inspired by my mother and other relatives, as well as my own personal experience. The emotions are real, though the details, circumstances and situations are different from the real-life events. Effie Kammenou: I just Finished The Masterpiece by Fiona Davis. As a New Yorker, I appreciated the peek into the history of Grand Central Station. It was a beautiful story told from the perspectives of two women—one living in present day and the other in the 1920s. IAN: Are there any new authors that have caught your interest? Effie Kammenou: I just mentioned Fiona Davis. She was new to me and I plan to read more books by this author. Chanel Cleeton is another author I will read religiously. Her book Last Year in Havana was one of my favorites reads of the year. Effie Kammenou: The writing community has been generous and welcoming to me. When I finished writing my first book, I had no idea what to do next. I received helpful advice and aid whenever I needed it. I soaked up everything more seasoned authors were willing to share with me. In turn, I do the same for less experienced authors trying their hand at publishing and marketing. Effie Kammenou: That is the goal! I was a theatre major in college. It was always my dream to act professionally. I got married, had children and needed a real job with a steady salary. I worked in the optical industry for forty years. Once my children were grown, I wanted to, once again, fuel my creative energy. I did this through writing and I thoroughly enjoyed it. I’m now in a position to make a career of it, whether or not it earns me a decent salary. IAN: If you had to do it all over again, would you change anything in your latest book? Effie Kammenou: I’ve thought about this a lot. There is one chapter I wish I had written. A chapter from the perspective of one of the male main characters, RJ. There are two love stories in this book and I give Zak, the other male love interest, a chance at his own chapter. I wish I had done the same for RJ. Effie Kammenou: If we’re speaking of contemporary writers then I would have to say Sylvain Reynard. He is not only a master wordsmith, but he has great knowledge of literature, art, history, music and religion. He brings all of this into his work along with deep messages, while bringing the most sensual and romantic characters to life. IAN: Do you have to travel much concerning your books? Effie Kammenou: All three books take place in New York and several different locations in Greece. This last book, Chasing Petalouthes, also has a section of the story set in Paris and Champagne, France. Being of Greek heritage, I’m familiar with Greece, its culture and people. But I had to visit and see it with different eyes to write about it. I did a tremendous amount of research on the Champagne region and the process of champagne making. But in order to really write authentically about this corner of the world and its industry, I had to see it all for myself, speak to vintners and immerse myself in the culture. Effie Kammenou: Currently, I am working on the first book in a new series, which will also revolve around a Greek American family. The dynamics of this family will be quite different than that of the families in The Gift Saga Trilogy. In addition, I’m contributing a short story to an anthology titled, Paperback Writer. The proceeds of which will go to the World Literacy Foundation.